On the Central Coast of California, Highway 1 winds through a section of rocky coastline known as Big Sur. Flanked by the Santa Lucia Mountains to the east, and the turbulent waters of the Pacific Ocean to the west, this is truly a place where land meets sea. For road trip enthusiasts like Brian and myself, making the drive to explore this part of California is a must-do. Here are five stops we recommend making if you are looking for some of the best places to visit in Big Sur. What was once the estate of the publishing tycoon, William Randolph Hearst, is now a state historic monument and one best places to visit in Big Sur. It’s no wonder that this coastal retreat nestled on the hills above San Simeon is now a big tourist stop, especially during the summer and holidays, but don’t let that deter you. If the gorgeous Spanish style architecture, famous Neptune Pool, and surrounding gardens aren’t enough to tempt you to visit this gem, take a tour of the beautiful house, which is fully furnished with exquisite antiques and an impressive art collection. In order to make the most of your day, make a reservation online for an early tour. Though it is pricey, I recommend doing two tours – The Grand Rooms and the Upstairs Suites – because you get to see much more of he house. On our first visit, we did the Grand Rooms only at first and felt like we didn’t get to see much, so it was a good choice to add on the second tour. The Upstairs Tour included a smaller tour group, and it felt like you got to seem more of the house – including the living quarters, and Mr. Hearst’s private study and library. Book enthusiasts will be amazed at his vast collection of first edition and antique books. After the tour, visitors are free to roam the grounds. Don’t miss the Neptune Pool and the Indoor Pool. Both are very cool! Remember you have to take a tram up to the house, so you will easily spend a few hours here. Even if you aren’t much of a hiker, the Ewoldsen Trail is beautiful, making it one of best places to visit in Big Sur. 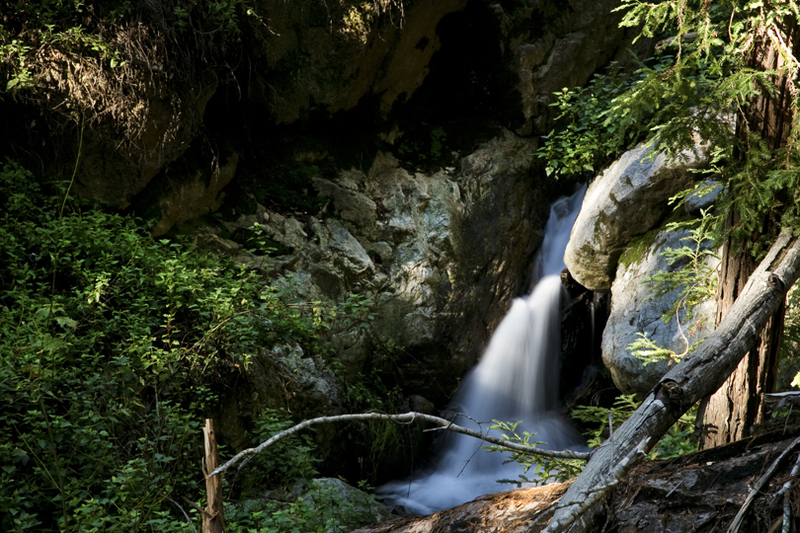 This small little canyon is full of towering redwoods and lush ferns that follow a cascading stream. The air here is cool and wet, which is a stark contrast to the surrounding landscape. You can take a casual walk up to Canyon Falls, or make it a roughly five-mile loop that takes you up above the forest canopy. 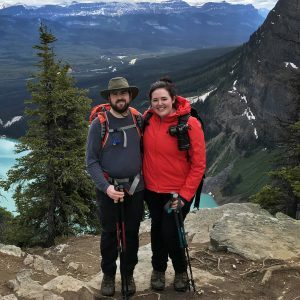 Read more about the hike from one of my favorite hiking blogs, Modern Hiker. If you are driving north, the entrance is on the right side of the road about 50 miles north of Hearst Castle. The parking lot will be on the right side of the road. Bring cash to pay a small parking fee ($10). Keep in mind that this is an incredibly popular stop for tourists, so chances are there will be a wait to find parking if you are there on a weekend or holiday. As with most tourist stops, get there early to avoid crowds! 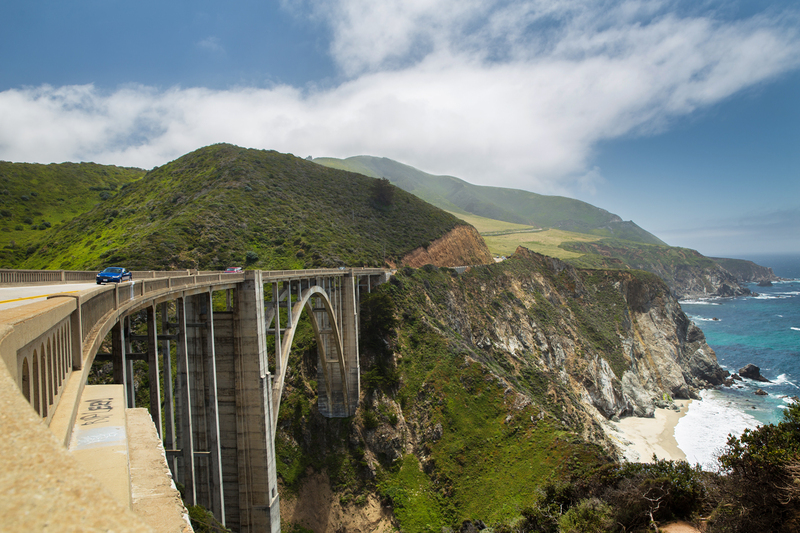 This is an iconic landmark in Big Sur that is not to be missed. After all, how often do you get to see a waterfall filling up a turquoise blue cove along an abandoned beach? The best part about stopping here is if you already parked to do the Ewoldsen trail, you don’t have to go anywhere! After the hike, head to the other side of the road via a small walkthrough tunnel. A short trot down a walkway will take you to the side of the opposite cliff, with tons of photographic opportunities to capture the stunning falls. This spot is bound to be full of tourists and enthusiastic photographers, but it’s a beautiful sight to see. The best light for photos is in the afternoon when the sun is lighting it from the front. 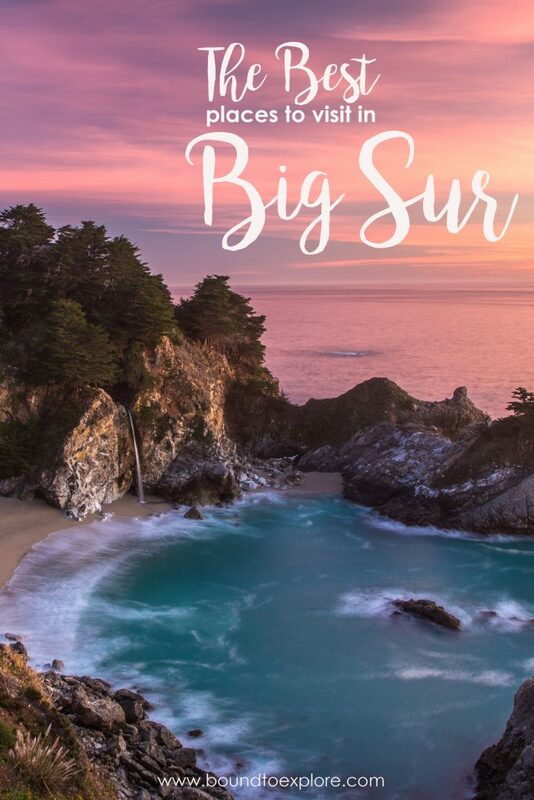 This is my favorite stop on my best places to visit in Big Sur list, especially for sunset. 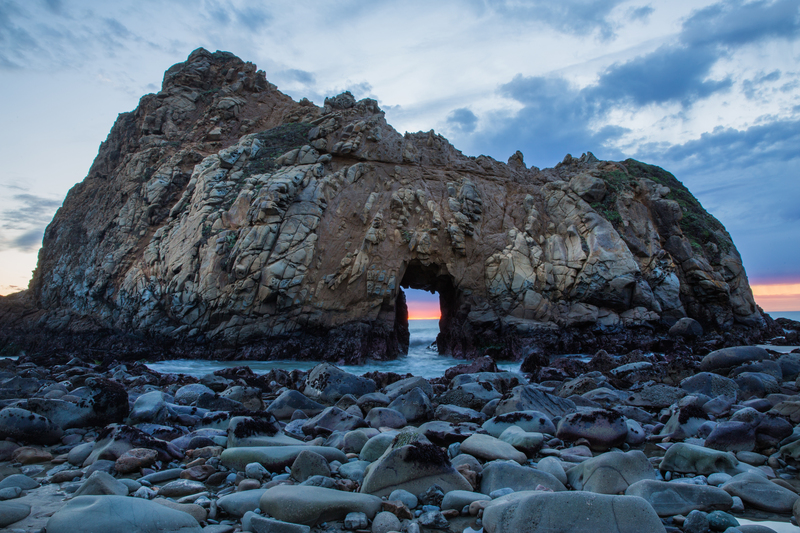 This is the home of another iconic site in Big Sur, Keyhole Arch. The beach can be hard to access, but it is worth the trouble. In January, if conditions are right, the sun sets and shines right through the hole in the arch. Another interesting feature of this beach is the purple sand. Again, conditions have to be right, but usually if you hit this spot after it rains, you will be able to see some. There was a bit when we went, but it was so minimal that it did not make for a good photo. If you are planning on doing photos of the sunset in January, stake your claim with your tripod early. There were a ton of photographers when we went, and those who came late had a hard time making a good composition. Also, finding the beach is a bit of an adventure if you don’t know what to look for, or plan ahead of time (note: you probably won’t have cell service for most of the drive). Coming from the south: After you enter the town of Big Sur, you will make a left onto Sycamore Canyon road. Here you will pay a small entrance fee (It was $10 when we went), and then you will make you way down a pretty rough, unpaved road. Just take it slow, and be careful, and you should be fine. Don’t miss this spot because it is also a favorite on my list of the best places to visit in Big Sur. 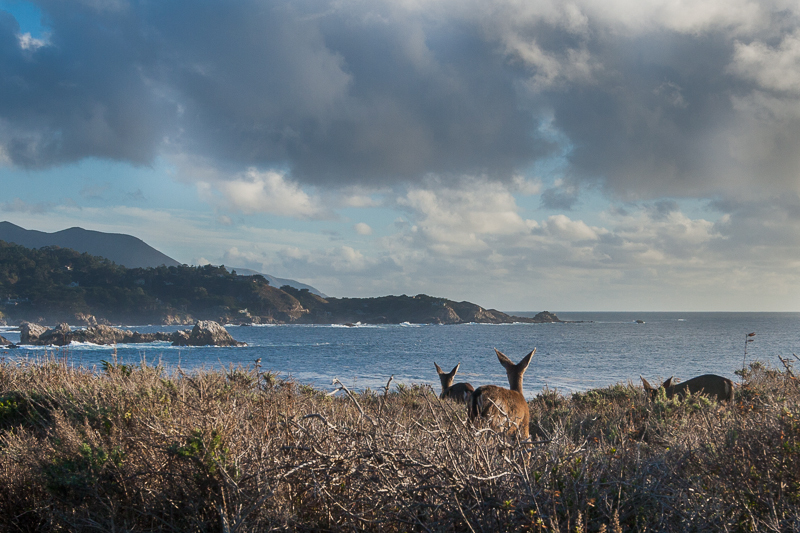 Point Lobos is a nice place to walk around and explore the rugged ocean landscape of Big Sur. There is a fairly extensive, and easy to walk, trail system that takes you through bright wildflowers, windswept cypress trees, and rocky beaches. Along the shore you might be able to spot some sea lions sunbathing or sea otters frolicking in the waves. Definitely don’t forget your camera because you will want to take a photo at every turn. 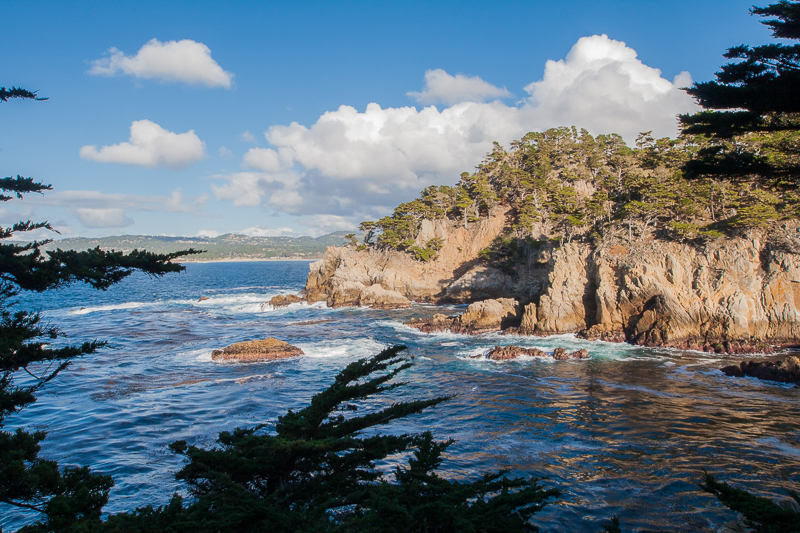 Point Lobos is located at the north end of Big Sur, so if you are staying in Carmel or Monterey, is an easy drive back to see it. Also note, to park in the reserve, there is an entrance fee of $10. I couldn’t leave out the iconic Bixby Bridge. A quick stop on the north side of the bridge will give you the best vantage for a photograph. Please be careful, and courteous, as there is no formal parking lot to pull into. That photo of Keyhole Arch is amazing! What a beautiful spot. You’re right…so worth the trouble of getting there. Your photos are so amazing! This is definitely one of my fave areas of the California coast. Hearst Castle is so beautiful as are all of the more natural landscapes. I really appreciate you saying so, Constance. You are right – Big Sir has a nice mix of architecture and natural landscapes to explore! McWay Falls reminds me of the Mermaid Lagoon in Peter Pan. So gorgeous! Thank you very much Alli! There are so many places to visit on this trip! I’ve been to some of but not all of these. 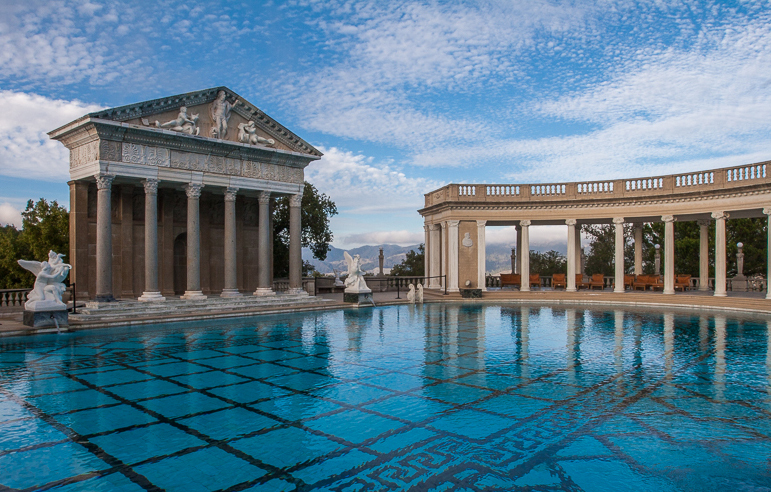 Hearst Castle is one of my favorite places in CA and has been since I first saw it as a kid! The library is indeed stunning, but I’m still to this day entranced with the indoor pool and my dream is to swim there one day! I do need to see McWay Falls soon! I love Hearst Castle! as well! Swimming in one of the pools would be a dream come true! 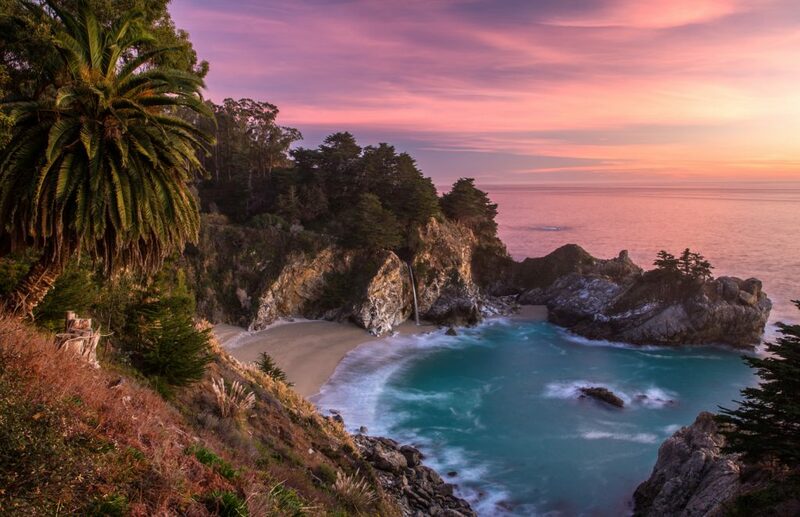 I hope you get to visit McWay falls soon! It is such a cool place! There are so many beautiful places to see there! Your pictures speak for themselves and you made me curious to have a roadtrip in California!! Thank you very much Adela! You should definitely come here for a road trip. The state is so diverse and beautiful! All of these places look amazing! I didn’t realize that CA had so many amazing nature views! Thanks so much Kelly! Yes! We have many incredible places here! Be sure to check out our destinations page for more posts on the state.